A dusting of snow on Lake Mountain this morning and more snow expected through the week. Post your pics and trip reports for the winter in this thread. The mountain is guaranteeing snow (mix of man-made and natural) for this coming Sunday. So come up and get a taste of winter early. Hopefully LM gets a little more out of this system, it sure seems cold enough and possibly low enough still. Can't wait to get up there! I imagine they'll wheel it out in the next day or two, as soon as it gets cold enough. Or it may be out but going elsewhere. But they have a new one - much much bigger than the yellow one, apparently. They're planning to make snow on the second toboggan run, so that the main one won't get so congested when the snow's not A1. Hey Tecks keep us posted with the conditions - I could be tempted to pay a visit if there's enough to slide on. Shame it's not white up there - maybe later this arvo? I reckon snow level will be too high. It's 10 degrees in Narbethong atm. Too warm to snow on the mountain. Maybe it will snow over the next couple of days. 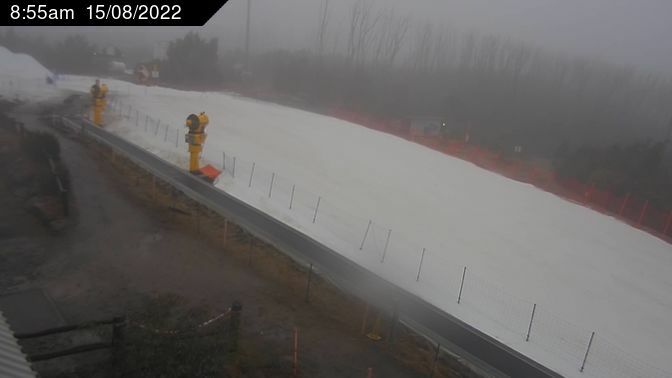 Today (Thursday) afternoon, it looks like a cm or two of wet slush on the toboggan slope. Fingers crossed for tonight. That's good news as it was a bit much on top of a $50 or whatever entry fee. Sorry p2p. I should have posted that when I found that out a couple of weeks back. The XC500 Club is still the best deal in Australia that I'm aware of. If you expect to go there at least 4 times in the year, you'd be crazy not to go for it. maybe if you only have 1 person in the car. Huh? $168 for the XC500 Club, and that includes your year' season's pass. More than $100 cheaper than FC! Pretty sure it's irrelevant how many are in the car. Good deal if you want to take your chances on the season at LM. Something of a gamble these days IME. Meanwhile, new admin. at LM could not sell me early bird all resorts pass, which I have purchased from them for years. So FC has my business. -extra child â€“ $7.00 per month or $84. I interpret that as meaning that it is individual membership, not for a carload. But entry is by car, not by person (unless you're on a bus). So how could they let the driver in if he/she was a XC500 member, yet charge the passengers? You are correct in that the XC 500 is for the car regardless of how many are in it so is an absolute bargain. if the resort manger says so, then of course i accept it. but riddle me this - WTF does the web page mean then with the child &amp; family prices? The new CEO of the resort dropped into my shop last night on a social visit. I asked him just that question - why would anyone go with a child or family membership. He responded that it mystified him and if Belgravia are still running the show next year, he would like the whole thing changed. So yep, jump in this year while it's still going. No natural snow for the opening weekend, but that's no different to the rest of the country's resorts. But there is man-made snow - 50cm deep on the main toboggan run. However looking ahead - our best chances of snow over the next week look to be Friday and Saturday (14th &amp; 15th June). At this stage I would say that we may get snow falls on those days but interspersed with rain periods. Let's hope the weather charts change for the better over the next couple of days. Wow, that's good. Has anyone seen the cams on the website, It looks like there snow making for the XC trails, probably building a base for the sprint x, let's hope there building a little bit of a base of the trail head, it gets worn out so quick! They have invested in quite a bit of new snow-making gear, and they're hoping to be able to cover 2 tobgoggan runs, the beginner ski school area and the trail head. I've also spoken to them about reinstating a live trailhead cam as they had before Black Saturday. The new CEO says there's a camera mounted in that vicinity so he'll see if he can get it operating. Thats great that things a finally going well for XC at LM, I never knew there was a trail cam pre black saturday times. Teckel did you hear anything about plans for a new building or ski club? last year they said proceeds from tickets/season passes went to funding a new building. That snow looks really dirty, opening weekend must have been busy, It looks like 50cm when theres people standing to show a sense of scale. Lets cross our fingers for some low level snow 14th,15th my xc skis are busting to be skied with! I never knew there was a trail cam pre black saturday times. Yes, first camera we installed there. Was their only cam for a number of years. I think the XC Club - will be a room, rather than a separate building. But I've heard nothing about it. If I do, I'll post here. The trailhead cam was attached to the old ski patrol room at the back of the old taj mahal dunny block. No reason other than it stopped working for a year and so we took it off. Never noticed it back up, will sort. I think Lake Mountain will miss out on snow later this week. I think it's one or two hundred metres too low. We may get flurries, but that will be washed away by all the rain, imo. Monday or Tuesday are looking good at this stage for something - unfortunately not much, as it probably won't be wet enough, so it will only be a limited amount of snow that falls. I can't see it being enough to call it a season starter. Looks like the cams are down again? They sure are, although today they posted a panoramic video of the toboggan area and have done so a few times. They must be having issues with them. Sam, it certainly wouldn't have improved from a couple of days ago. I think we just have to be patient and keep all body parts crossed that it will come sooner rather than later. Now, don't everyone rush up at once! They bought if from Baw Baw &amp; is called 'the tube'. Let's hope it keeps going most of the night. It was 8 deg in Narbethong as I was driving home, so I don't like the chances of snow all night I haven't even turned the heating on - just too mild for it. Just been told its snowed about 5cms at LM and still going! Seems from this morning's cam that we've lost quite a bit of it, but nevertheless, it's a start. And hopefully, for the skiers, quite a bit more higher up. Reports from the mountains are saying average depth on the trails is about 2.5 cm. Not enough to do anything, other than look pretty, but it's a start.